I really enjoyed the 2016 San Antonio workshop and was hoping to improve my detail work in the shadows. I'm sending my drawing of rocks that were done after the workshop as a preliminary drawing before I finish tackling the horse. My goal here was to get detail in the shadows and show depth. I've attempted to sharpen the lines and edges, which my earlier studies were lacking. Before I comment I should tell you that I've straightened your photo and, in line with your mention of achieving sharpness, I've applied a little judicial sharpening. Hopefully, it looks like your original, but bear the changes in mind as you read. Have you succeeded...yes! There's no doubt at all. I literally feel I can push my arm into that cavity and explore the deepest rocks. I confess I'm a bit of a "feely, touchy" fan. Before I begin working on a texture I imagine what it feels like under my wandering fingertips. And the same applies retrospectively when I'm viewing work by other artists. If I can "feel" the texture then it's succeeded. With your drawing, I have no problems. My fingernails catch on the gritty, angular foreground rocks. I can trace the layers of the sedimentary rocks on the right. The darker rocks feel slightly smoother to me; colder but still heavy and solid. And my attention is slowly drawn in to the ever-darkening rocks until I'm almost at the rear. "Almost" because I can't really tell where "rear" is. 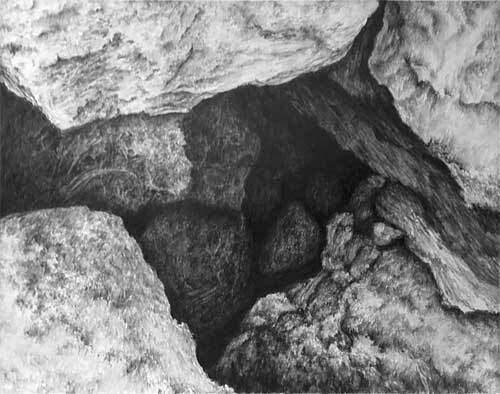 You've very cleverly pushed the deepest rocks so far back into the shade that they are mere impressions of rocks. There may be yet more still deeper that I can't see. And that builds in an enormous amount of depth and mystery. I think this is superb. I'm captivated by the variety of forms and textures exhibited by the rocks. And, above all else, I feel you were living the scene - immersed in it to the point that is existed as a three-dimensional reality for you. That, in my opinion, should be the ultimate goal when drawing - especially when working on something completely invented from your mind. I can't wait to see your completed horse drawing! Wow - not finished but trying to keep with my goal to get you something 1 month after our course finished. Amazing how many hours this takes and how nicely the lessons make sense when you put them together. Not sure after I finish this what to do to keep up this practice--I need many more hours but I don't think I have mastered these skills enough for the advanced course...I did have trouble taking the training wheels off my first bike too. Your photo was a little distorted and darker on the right side than the left. I've attempted to return it to its original glory, but that did involve some guesswork. So apply what ever I say to your drawing after comparing it to my version. Robbie the dog is looking good - plenty of texture, although the three-dimensional form within his white areas is lacking subtle shading, but that might a result of your photo. He looks black and glossy, and you've made good use of reflected light to split his back away from the dark interior of the henhouse. 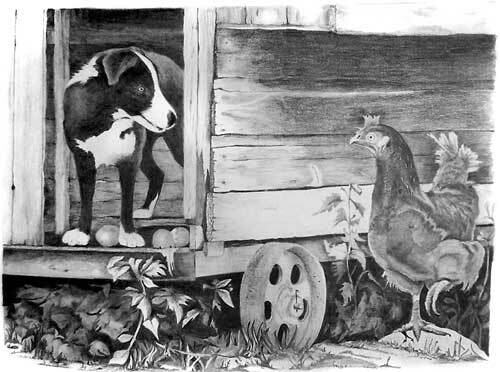 You've even darkened his rear paw - it's inside the henhouse and in his own shade. Leaving it as white as his front paws is a common mistake you've avoided. He has a lovely glint in his eye that immediately draws me to him. The broken eggs are nicely displayed, and they have a natural smooth texture too. The wood of the henhouse looks old and rustic without attracting too much attention. I really like the way you've used the angle of the cast shadow that falls across it to point us towards the hen's head. And you've made good use of values within the wood to make her stand out from of it. Henrietta herself has excellent three-dimensional form due to your bold use of contrasting values in her shaping. She also looks appropriately displeased!. As with Robbie's eye, the lightest values have been reserved for her head so my attention is easily drawn to her. And those light values increase the contrast of her black pupil so I clearly read her mood. The only thing she's lacking is really believable feathering. She is super-smooth, which isn't necessarily wrong, but I think just a few well-chosen sharp edges to define a feather or two would quietly send the "feathered" message. You've also echoed the light values in her raised foot, which was an excellent choice. That raised foot is the only implied movement in the composition, We don't know if she's running or has halted to take in the situation, but it adds a degree of tension, so it's an important element in the simple story. The henhouse's rusty wheel is well-executed. The ellipses are perfectly formed - that's so important; any inaccuracy is immediately apparent and unsettling - and I like the retaining nail that been pushed through the axle. Little touches like that subtly add a lot of realism. I won't comment on it more because I suspect it's much sharper in detail than it appears to be in your photo. The foliage is good if a little lacking in midground detail. There's quite an abrupt jump between foreground and background foliage. You've created depth but a midground with values midway between the two extremes would help to draw our eye back into the weeds. That creates more depth, but your foliage does its job quite adequately. Apart from Henrietta's rock needing some three-dimensional shading, the foreground works very well - minimal but very effective. The broken ground and small clumps of grass nicely set the scene and lead in the eye without attracting the viewer's eye away from the two main players. You should be very pleased with this... I am! "thanks again for the workshop. I've become much more creative since then, and I've actually finished the bunny picture. Well, I did change it a bit - the bunny is looking hungrily at a small child's carrot ball. In my mind's eye, Bunny is about to hop over the barrier and get those lovely carrots. I hope I've captured some of the whimsy I was going for. After looking at the pics already submitted, I don't think I have the necessary depth of blackness that would make it more realistic. But I want to get your ideas before I go any further with it." I love the idea, and creativity, of the carrot ball! And I think you're telling your story successfully. However, you're correct - your lack of darks is severely impacting the three-dimensionality and life. I've darkened your scan on the left because I think it is lighter than your drawing, so please bear that in mind. My first impression was that your drawing is lacking depth and an understanding of what you are trying to draw. The latter applies more to the midground and background where you don't have sharply defined elements to work with. 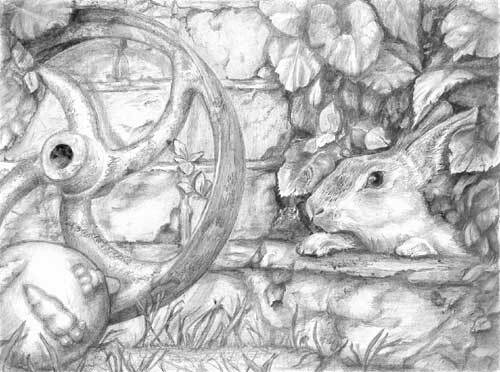 Working from left to right, your rusty wheel began well but then quickly lost the darks and midtones that give it form and solidity. Of course, you might be "working this up" as you draw but I've never understood that approach so I can't comment on that. Personally, I prefer to "see" each area and draw it as I understand it. Then I move on to the next area. 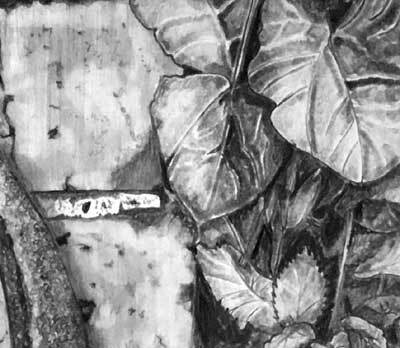 To return to the top left corner: your leaf has recognisable three-dimensional form; it casts its shadow on the wheel, so you've created depth; and the wheel has the makings of a rusty surface. But then you've quickly dropped the darker values and used only light greys and white. A palette of light greys cannot suggest any great depth; you've had to use white to make your greys look darker; and rust does not contain white, so it loses any sense of realism. Rusty metal - cast iron in this case - is non-reflective and contains sharp-edged pits with dark bottoms and tiny highlights on the edge facing the light. Do keep your edges sharp. Your corner leaf is obviously in front of the wheel but with much sharper edges it would spring forwards. Remember: sharp edges separate elements and planes; soft edges merge them, as if they are somehow connected. Also, when you drew the shadow cast by that leaf you fixed the direction of light as being from the top right. Now bear that direction in mind while you draw everything else. Just ask yourself as you draw "Can this point beneath my pencil see the light? Only partial light? Or no light at all?" For example, you have deep shade within the axle hole in the central boss. Do you not think the underside of the boss should be almost as dark? That face is at exactly the same angle as the top face of the hole. Reflected light will dilute it a bit, but it should not be as light as you've drawn it. The bricks are nicely underplayed with sufficient interest for close inspection but not vying for attention. However, like the rust, bricks do not contain white. Darken your darks and you'll be able to remove the white. If you do that by simply layering them all with a 2H, or even HB, you will dull the white and your bricks will instantly look more solid. You can leave some white in the mortar, which helps to differentiate it from the brick. It's a debatable point but I maintain mortar contains sand, and sand contains grains of reflective quartz, so bright highlights are not altogether unnatural. I'd just choose to exaggerate that and include more white. 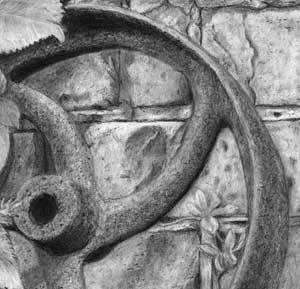 With the bricks completed, then strengthen the shadow cast by the wheel on the wall. That will help to tie the two together, reinforce the leaning angle of the wheel, and remove any need for outlining of the wheel (which you've already successfully removed). As I mentioned, I love your solution to the insipid rock problem! The carrot ball is sheer genius! When you've expanded and darkened the values elsewhere, I think you can be even bolder with the three-dimensional modelling of the ball. It definitely has form but it's also of almost of equal importance as the rabbit is to your story, and it's a little lost at present. 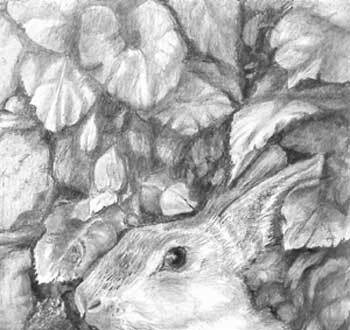 Moving to the top right - the foreground leaves above the rabbit have believable body and three-dimensional form. I can almost run my finger over them and feel each undulation, although you've used white again to compensate for your relatively light dark values. These leaves are green; they don't contain white. Save white for your bright highlights. The extreme left-hand leaves have delightfully sharp edges, so we instantly understand their forward position. Moving right, you lose that. The edges become soft, so everything tends to merge into a single mass. And you've lost depth too. Sharp edges coupled with cast shadows will greatly assist with the perception of depth. Your rabbit is lovely! Its head has a believable hairy texture that correctly varies between coarse on top and softer down the side of the head. Again, you've used a lot of white within the coat that is diluting the strength of the highlight in its eye. Brighten the highlight and lightly layer the body with 2H to dull the white. And while you're doing that, ensure the pupil is as dark as you can possibly make it - try 2B burnished with HB. The eye is superb but, as I said, try to intensify the contrast between the black pupil and the bright, white key highlight. That will ensures my attention is drawn directly to the rabbit. The stone block beneath the rabbit's paws looks a little strange. You need to show the top is on a different plane from the front. You have the light shining from the top right so I'd expect the front to be darker than the top. At present you're using positively drawn grass to appear to be in front of the light stone. When you darken it you'll have to use negatively drawn grass or it will disappear. Work background to foreground - outline your grass, shade the stone, and then you can engineer the grass to stand out of blend into it. Element by element, this is coming along very well - it just needs more varied shading to encompass as wide a range of values as you engineer, and the courage to introduced lovely rich darks so you create a lot more depth. "I really enjoyed your workshop in Calgary this summer. It was so nice to spend three days drawing in such a relaxed and friendly environment. I came away with new knowledge and more motivation to spend more time drawing. Here is my "home work" for you to take a look at. Thank you so much for making the trip to Canada!" Well...where do I start? Let's begin with superb, and then add a dash of beautiful and throw in a light sprinkling of almost real. It does have a couple areas that could be improved on but overall it's a lovely drawing. Let's start top left and circle around. The initial darks in the old wheel fixed your tonal range and you chose very dark values, which gave you a very wide palette to work with. That in turn increases the three-dimensionality. 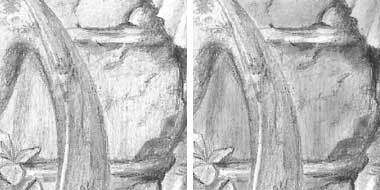 For example, the top left leaf is so obviously forward of the wheel; it appears to be responsible for the darkness of the wheel too; and the separation is beautifully stated with that crisp, sharp edge. The same applies to all your other leaves, and any edges where sharpness is imperative. The old wheel is perhaps not as obviously rusty as it could have been, but it's so splendidly solid and three-dimensional that the detailing of the rust is not so very important. I might be being over-critical; it has the appearance of light rust rather than deep pitting and the edges of the rim are smooth, where I expect rust to have eaten into the surface with hard-edged marks. The bricks behind are nicely judged - they contain form and detail but in a way that doesn't grab attention. They're good secondary elements that provide a suitable and sufficiently understated backdrop. And allowing the light to catch the lighter mortar gives it added interest, as well as signifying it's a different material. The right-hand foliage is... touchable. I can almost feel the smoothness of those leaves, and you leave me in no doubt concerning their forms and spatial relationships to each other. You've created good depth too with those elements in the shade. I would, however, suggest that the depth could heave been increased by yet another layer, or layers, further back. The black holes are essential for depth but some are so large I expect to see something in there - not something I can recognise, but organic shapes of some form or another. Your rabbit is simply masterful! delightful! Before I begin drawing an animal I imagine the feel of stroking it and pushing my fingers through its hair. The textures you've created are exactly what I would expect to experience. It's soft in places, such as the cheek, and coarse on the top of the muzzle, and both work to contrast each other in a subtle way. A little extra darkness inside the ear would have increased its internal depth, but it works as it is. The body hair was well interpreted - you've banished those wiry guard hairs, that would have attracted far too much attention, and instead used that texture for the fringe around the neck, where it achieves the most benefit. But above all else, your rabbit has the most wonderful dark and glossy eye. 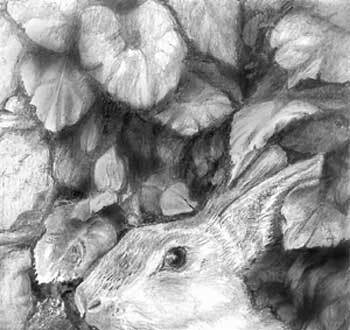 The strong black values and bright highlight draw our attention to it immediately, making the rabbit the obvious focus of the drawing. I notice you've also altered the rabbits feet so they appear to be different... possibly you noticed that I cloned one to create the other absent one in the reference. Overall, your rabbit is simply alive and full of character. I love that light curve beneath the mouth that accentuates its "grin". The foreground is not, I think, the best area in terms of reality. That rock needs shaping and form! Or covering with foliage, or even removing completely. That said, it's so tonally flat that it almost disappears, so maybe that's beneficial. You had a really good try with the grass and it almost succeeds. In fact, to a large extent it does succeed, but it suffers from a lack of depth greater than the foliage above the rabbit. Again, there are dark holes of a size that I expect to see more within them. There's also a good deal of outline used in that area, so do try to use adjacent variations in value to define edges. Cast shadows are wonderful devices for creating that difference. However, despite my last more negative comments, this is a superb drawing that I admired as soon as I saw it. Even though it contains nothing that we didn't cover during the workshop, this composition was intended to stretch you and move your out of your comfort zone. On that basis I think you should be extremely proud of the result. Well done! "Hey Mike, This is where I'm at now. I feel like my tonal values are all the same. My bricks look like wood.... My grout is lost. 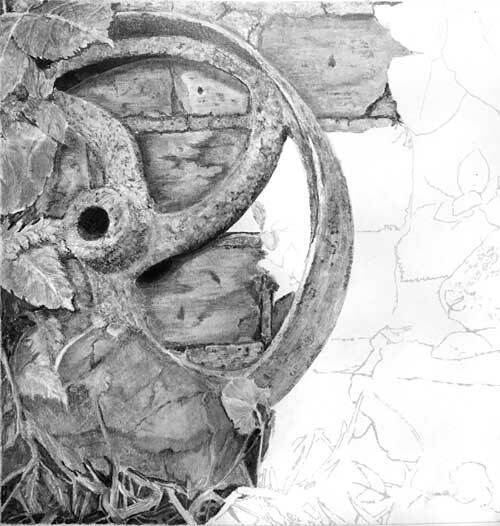 I'm also struggling as whether the wheel looks like rust. I can't "feel" it! Please point me in the right direction. I'm trying very hard not to bounce around like I'm known to. I want to work from top left and work down and across....."
OK, let's start with the "wooden" bricks... I like their surface features and the use of thin highlights beneath each hole, so there's no uncertainty that they are holes. But maybe the linear shading is just a little too pronounced - hence the sense of woodgrain. You can fix that by lightly blending with a tortillon - taking care to avoid all sharp edges, because blending will soften them. Once that's done I think your mortar (grout) will posses more grittiness. You could also pick at the mortar with a thin point of Blu-Tack to take a few key spots back to white. I think the inclusion of white would be quite acceptable. The mortar will contain sand, some of which will be grains of quartz, which is quite reflective. Making certain there's no white left in the bricks will also help with the brick/mortar, smooth/gritty contrast, although blending the bricks might achieve that. The rust is very close to being realistic. Just imagine dragging your fingernails over a rusted cast-iron surface. You can feel them catch on all those sharp-edged pits. So you need very sharp drawing for rust. Shapen yours up a bit and then pay particular attention to the edges - particularly the edges of the wheel's rim. That's one place where you can make the rust eat into it, and make it clear that the surface is rust. 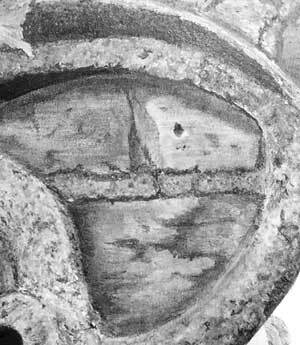 Use hard, strong, choppy marks to suggest the angular faceted nature of the surface, and lots of contrast. Next, consider spreading the shadow cast by the wheel - diffused, without a defined edge. That will push the bricks back further. Then do the same for the leaves. Allow them to cast shadows on the wheel to separate them from it. Again, they need not be sharp-edged, just a darkening of the area behind them so the darkness more clearly defines the edges of the leaves. Also, allow the leaves to curl and reflect light if that helps. Just a narrow curled edge with a bright highlight is sufficient to very clearly show where that edge is. Their are hints of that in your top-left leaf, and it works subtly and well there. Finally, that rock needs work! Either banish it altogether or give it much greater contrast and three-dimensionality. And the grass at the base needs midtones - it's either bright and foreground or dark and background, there's not much midground. My final drawing of the course ready for your critique. I used the HB pencil a lot for this one. A little bit of 4B for the darkest areas like the nose, eyes, contact and cast shadows (before they get diffused further out). Harder grades to try and get the smoothness of the glass top. My shading isn't as smooth as I'd like. The angle of the boards on the desk top aren't quite parallel to the angle/corner of the joining background. Lady's "fur" has too many hard edges. Still I think it turned out well despite these problems. I too think it turned out well. The "errors" are minor and don't detract from the drawing at all. And your choice of grades, and their uses, was well thought out too. First, Kitty's dark eyes, and her high-contrast bright highlights, immediately draw me straight into the drawing and directly to her. And the dark oil reservoir of the lamp balance Kitty's dark values very well. The lamp has solidity and accurate ellipses, which are not easy to achieve, although the base is offset to the left. Both brass collars have a lovely silken sheen and a soft highlight that perfectly describes their round natures, as do the receding cutouts as they disappear around the sides. The glass chimney is looking good and, with its bright, hard-edged highlights, is quite realistic. The oil reservoir below is not so obviously glass. Glass is shiny and hard, so visible linear, or patchy, shading rarely works well. I think this area is either overworked or contains too much linear shading so, as a result, it doesn't possess the smoothness usually associated with a glass surface. Kitty is looking directly at the lamp with a quiet concentration, which forms a nice bridge between the two. I like the way the ends of her downturned mouth point upwards, which softens what otherwise might be a displeased expression. Remember, we humans look for and understand human emotions, not canine ones, so upward pointing suggests a smile. She also has a good solid sense of three-dimensional form. The hard edges in Lady's fur that you mentioned result in her not looking very "ceramic" but that's acceptable. There is a minor problem with the cast shadows. Kitty has a very useful thin contact shadow around her base that grounds her onto the dresser's wooden top, and the diffused shadow to her right works well too. However, her shadow is the same heights as she is. And that's true for the lamp too. That suggests the light was shining directly at them, but the underside of the shelf above Kitty suggests the lighting was higher and angled down. It's not a major problem but it is something to consider in later drawings. You need to take care with shadows. We see shadows every day and they are seemingly unimportant, yet they are extremely powerful tools for an artist. We instinctively understand them and are even willing to "fill in the gaps" if some are missing. But shadows suggesting different lighting directions can cause confusion, if only subconsciously. The grain of the dresser's top doesn't follow the top's perspective but I know you are aware of that. And the curved end of the dresser is perhaps not as tightly controlled as it could have been, But, as I said, there's nothing major wrong with your drawing at all and I think it succeeds in telling its simple story. Ultimately, that's all that really matters. It was not an easy composition to pull off well - it was deliberately designed to move you out of your comfort zone - but I think you can be justifiably proud of this and the advances you've made in your work. Thanks, Jamie, I thoroughly enjoyed working with you. As you can see, I haven't finished my drawing, but am happy to post it for critique. However, I had a little bit more time tonight, and corrected the things that were most bothering me. There was quite a lot of distortion in your photo so I've attempted to correct that. And I'll bear that in mind, because I may have inadvertently introduced distortion elsewhere. There is much to be admired about this drawing. It tells the simple story very clearly with a definite connection between Kitty's gaze and the lamp. I like the way the dresser's top runs quietly into the background, and the background itself does its job and is unobtrusive. The rather complex curves on the end of the dresser are accurately constructed and drawn, which is often a problem in this exercise. The dresser itself is nicely suggested without it dominating the scene, and simplifying the moulding at the base of the back was a good idea - it could have proved to be a distraction if left as it was. I see it was a later addition and the angle is wrong but that doesn't do too much harm. Essentially, you've made the scene your own, and that's most of the battle won. Kitty is very well drawn indeed! Your interpretation of her three-dimensional form is unmistakable, and she possesses a solidity that suggests her ceramic nature. Her lovely dark eyes and nose immediately draw my eye to them, and it was a good decision to replace the rather strange painted triangular eye highlights with more realistic ones. The clever curves at the corners of her mouth give her a very warm and playful appearance, which add a great deal to her appeal. Your muted cast shadow describes Kitty's position away from the wall. 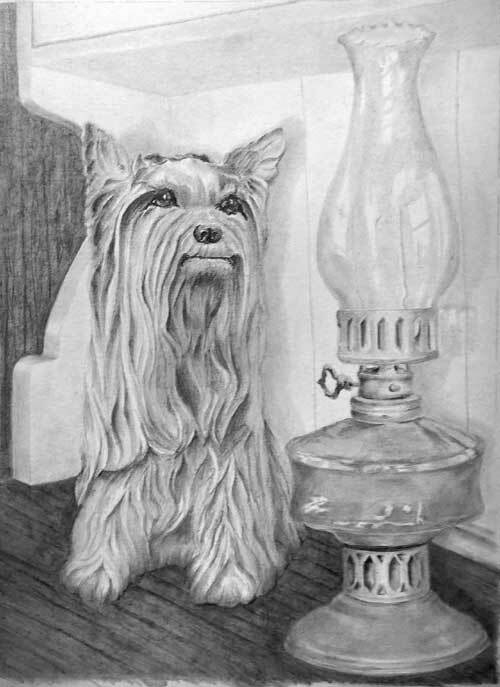 A darker contact shadow under the paws, might have helped to fix her more soundly to the surface, and balance her to the single dark band beneath the lamp's glass reservoir. I'm less happy with the shadow cast by the lamp and I think that's partly because you misunderstood its position. Kitty is under the shelf but the lamp is further forwards. Your cast shadows suggest both are an equal distance from the wall, and I think that also generated the placement error of the moulding. Despite your misgivings, all your ellipses appear to be sufficiently accurate, and both brass collars have subtle, satin highlights that suggest their rounded nature, assisted by the recession of the perforations. And the recession you've created between the front and rear edge of the top leaves no doubt which is which. That's tripped up many a past artist on the this course. The lamp itself looks good and conveys a full reality. The rim around the base causes a lot of problems. Both sides should mirror each other - and yours do. You could have used artistic licence and lightened the base to match the brass collar above it. Its current values match those of the glass, so whether it's brass or glass is not immediately apparent. I also think the relative lightness of the oil reservoir isn't helping that distinction. Making it darker might have better balanced the darks in Kitty, increased the difference between brass and glass, and given the lamp more presence. Apart from the value choices, the shading of the oil reservoir is excellent - and the highlights on the glass are simply perfect! Those sharp-edged, bright highlights are essentially what you'd expect to see, so they alone send the "this is glass" message. Even your choice of grades was ideal - hard grades to present a very smooth finish. The viewer expects glass to be transparent, hard, shiny and, above all, smooth and reflective - all of which yours is. The glass chimney works very well indeed. You can quite correctly use heavy lines or broad shading for the sides, as we are looking through a thickness of glass at that point. The same partially applies to the crinkled top, which will pick up highlights on the side facing the light and will appear dark on the other side due to the thickness of the glass. Again, you've interpreted that very well indeed, as you have with the rear of the top circle being correctly lighter than the front. It's there if the viewer looks for it, and it's quite obvious which half is facing us and which is behind. ...and I obviously had some problems with angles on the dresser...moved the divider, then realized that it is in the wrong place. Realised that I had not given enough thought in the planning stage. Everything looks much more accurate in the line drawing. Yes, some of your angles have strayed away from their perfect position, and you should give more thought to everything during the planning stage. Use the prep to solve as many problems as possible. Try to imagine yourself drawing each section so you can unearth potential problems too. 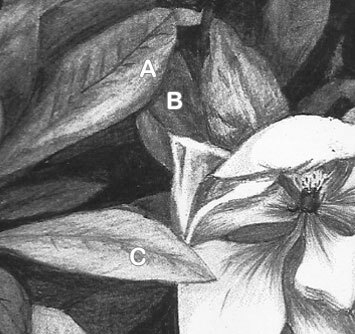 And, if you feel it necessary, you can work up your prep line drawing into a tonal study. I sometimes do that if the drawing is particularly complex. Again, its a way of finding and solving problems that might become evident later, as well as giving me a guide to work with. I feel that I learned so much from this last exercise, and have grown so much as an artist. A heart felt thank you for all your care with us. Thanks, Annie - I thoroughly enjoyed working with you. This drawing, although it contains nothing that we didn't cover during the course, was of course designed to stretch you. I'm delighted with your confident approach, attention to detail, understanding of what you were drawing, and interpretation of the reference. I think you succeeded wonderfully well! "Finally finished my homework... My friends love it although I can't get the breeze block as I want it." This is looking good, Jane. And completed in a week - you have been working hard! But.... ummm... you've missed a bit! Top centre. There's some excellent work here and your negative drawing in the grass looks good and creates a great deal of depth, but what pleases me most is your interpretation of each element. I can see you were drawing your mental picture of each, which is evident by the three-dimensional descriptions. I love the way you've modelled the wheel! 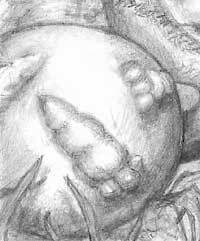 Rather than being over-concentrated on the texture, you've used that texture to sculpt the form. Despite the optical illusion error at the bottom, it's immediately understandable and possesses a feeling of realism. The illusion? You've continued the rim up one of the spokes, adjacent to the rock. Your leaves posses a solidity and sense of realism. I can almost run my fingers over their surfaces and feel the bumps and valleys. 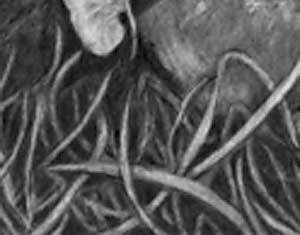 You've made an excellent use of negative drawing in depicting the lighter ribs and veins, and your tonal range is nicely pitched - descriptive of the surface without any one leaf becoming dominant or attracting unwanted attention to itself. 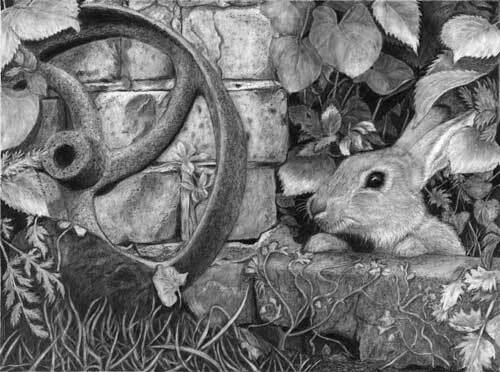 I do think you could have pushed one or two midground leaves deeper into the shade - to better connect the midground and background - but your deep dark shade down by the rabbit has created a good feeling of depth, and given you a wide palette of values for the leaves. I'm less happy with your brickwork and mortar, although you've done well to differentiate between the textures of both. The bricks themselves have sharp, hard edges, but I think your holes and surface flaws are too dominant. The holes have sharp edges, and you've exaggerated the lighting to add a light highlight to one edge, making it obvious each a hole has depth. But there are either too many or too many are too dark, so they become a distraction. The overall result is that I tend to see only the holes and not the bricks. Just making some more shallow (lighter internal shade) would solve that. 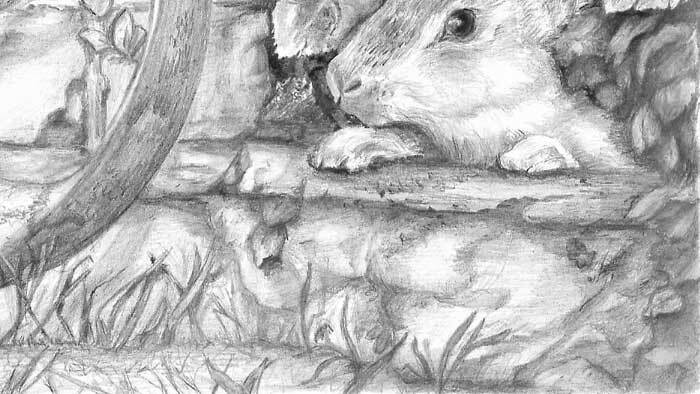 Also, leaving white in the mortar was acceptable and it helped to make it look different from the brick, but in one place in particular - as shown here - it's so white that it's fighting the rabbit for attention. You might consider making more of the diffused cast shadow of the wheel on the wall, especially at the top. Your shadows around the wheel suggest it is flat to the wall, which is OK, despite the lean of its perspective, but you've omitted the shadow beneath the top rim. Establishing that will further visually connect the wheel to the wall. Your rabbit is delightful! It has texture - and whiskers! Good indenting! And it has a strong black eye with a bright highlight that draws attention it. You've made good use of those sharply-drawn dark hairs on top of the muzzle, which increase the sense of softness of the cheek and body hairs. 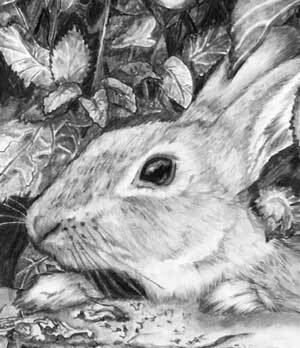 Overall, I think your choice range of tones used for the rabbit are rather light. That results in some loss of three-dimensional modelling, but not too severely. 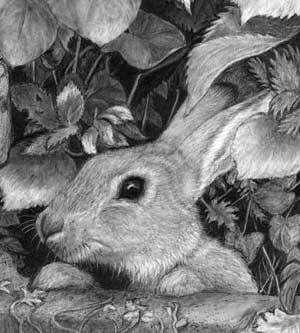 Returning to my mention that your interpretation was based on a clear mental picture - that's reinforced by the rabbit's feet. If you'd copied the reference both of its feet would have looked unnaturally similar. Only one foot was visible in the original reference so other is an actual copy of the visible one. 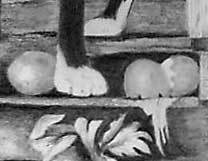 But, because you were drawing what you understood, rather than blindly copying the reference, you've naturally produced a perfectly acceptable a realistic pair of feet. Finally, that troublesome block the rabbit has it's paws on... I understand your feelings but no-one looking at this will know what you intended and they'll see it the way that makes sense to them. I think it's very acceptable. Concerning the drawing as a whole, for what is essentially a study that was intended to stretch your abilities into new areas, I think the result is something you should be justifiably proud of. 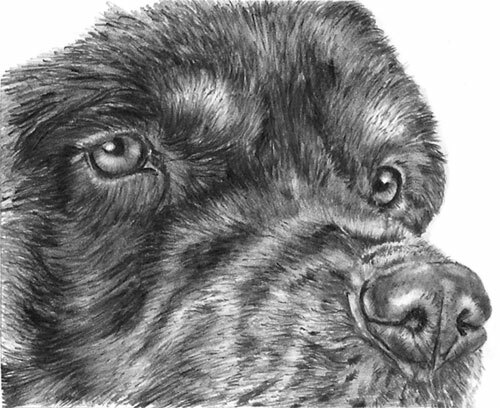 After the drawing dogs workshop April 16 and 17th 2016 I saw the last image for completion... I wanted to at least have a go after the workshop and give it some effort for you to have a look and give your critique if you would be so kind. I'm going to be a little super-critical, Tom, but there's a good reason for that, which I'll return to. The first impression is good. It has both believable textures and form. The eyes are glassy and possess character and feeling; the hair grows in all the right directions and has highlights that describe the underlying form; and the nose is very leathery and semi-reflective. You might recall that I stopped the workshop short of this final exercise because everyone was having a few problems with the "hair layers" exercise. Well, you've certainly grasped that one. The hairy ends of each layer are well-defined, and they definitely overlay the succeeding layer. There are one or two issues with the muzzle - more of understanding than technique - but I've no doubt they arose from the quality of the reference. This exercise was predominantly centred around choosing good values to differentiate between highlights in the black and the values used for the tan - and making the two obviously different. You've definitely succeeded in doing that - especially in the tan eyebrow patches. From an artistic point of view, think about the texture of the hair you are about to draw. Imagine running your fingers through or over it. How does it feel? I find having that in mind usually produces a coat that more closely mimics the reference. I like the way you've drawn the hair but it does look rather long. A Rottweiler has relatively short hair that is smooth to the touch. Finally, I'll return to the nose. In every other area I think you've looked closely at the reference and then drawn what you understood about it. That extends to the nose too, but your initial guidelines have twisted it. I suspect you drew it as you expected it to look. Having one eye higher than the other is a good indication that the dog has its head tilted, so the nose should conform to that angle. But you've drawn yours as being level. The nose itself is certainly drawn well - just be careful to draw what you see and understand, and not what you think something looks like. As a study, I really like this. Apart from the nose not quite "belonging", it has a sense of alertness in a face that is perfectly believable; and it's quite obviously black and tan. I think this is a really good result. I have finally finished the Henhouse Raider! Thanks very much, I'm looking forward to the Advanced class. I've already signed up! I pay a lot of attention to the first thing I notice, or the first feeling generated. In this case, it was Robbie's bright eye and inviting expression. And I think that's just how it should be. He's the principle character, with Henrietta a close second. Robbie is fairly close to being ideal. His nose is lacking highlights, which makes it look a little flat, but the gleaming highlight in his eye grabs my attention away from that. You've introduced a slight upward curve to the end of his mouth that suggests a cheeky human grin, and that works really well. Other than that, he's definitely hairy; he has excellent three-dimensional form; reflected light along his back that separates him from the dark wall behind; and (something often overlooked) his rear paw is in the shade. That alone tells me you were "living! the scene as you drew, and that is ideal. Henrietta's "worried" expression is excellent! I like that you've highlighted her raised foot and drawn it with very sharp edges. It's the only movement in the drawing and important to your story. We don't know if she's paused or running, but emphasising that foot certainly creates a degree of tension. 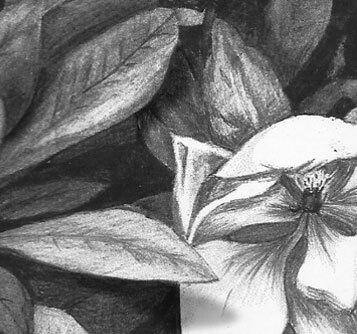 I've increased the contrast in this crop from your drawing, because you need to maximise it. You have established a black pupil and brilliant white highlight in her eye, but her body is very light, That's minimised the three-dimensional modelling of her form, and diluted the impact of her eye's highlight. As you can see, increasing the contrast gives her more presence. However, instead of being the red Warren Ranger that she was, she could equally be a Buff Orpington or even a White Sussex. It was your world you were creating so she is whatever you decided to make her. 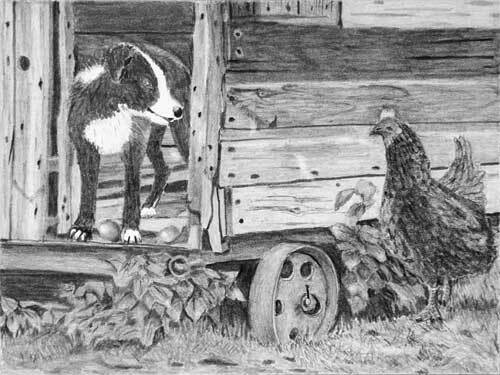 Working my way down, the wood of the henhouse looks old and weathered, and your nails are varied and natural, without either attracting too much attention. The shadow of the protruding nestbox is nicely judged, with soft edges, so it's present but doesn't distract. The foliage below Robbie has good crisp edges that help to emphasise the depth, as do the leaves that are positioned in the shade beneath the henhouse. I've just noticed the fallen egg in there! And another! I too like to leave small surprises that might go unnoticed for quite some time. The rusty wheel is rather too light, both in value and detail, and it has a problem. The bottom of the rim's inner ellipse is distorted - the width of the rim erroneously widens from top to bottom. That matters, because the human eye is immediately unsettled by inaccurate ellipses, and they harm the quality of the overall drawing. The foreground does its job very well. It has detail if I look into it, it leads my eye in, and it's not over-detailed or distracting. Overall I think this a really good result - sharp, contrasty and possessing life - and I hope you're as pleased with it as I am. I realised that I didn't submit any follow on examples from the Foundation + workshop from March 19/20. I completed this drawing in just 6 hours. It is a study of a photo I took in the Cotswolds in 2015 of a single flower head surrounded by a multitude of shrubs that covered one of the houses linked to Shakespeare. 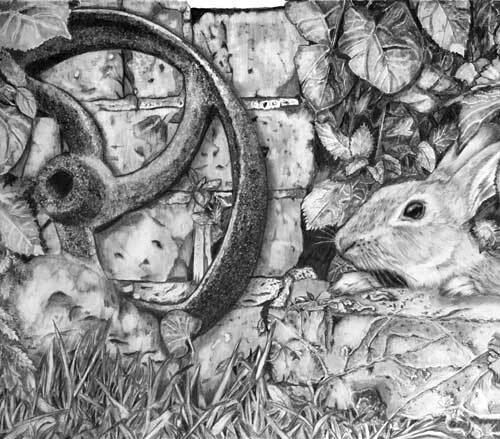 I used Negative space to complete the work and a number of alternative Graphite grades to complete the background to foreground showing the depth of field that I wanted to achieve. I hope you and any other readers like it? Well, I certainly like it. A lot! It has interest, clarity and depth. It clearly steps back through the layers, drawing my eye into it. 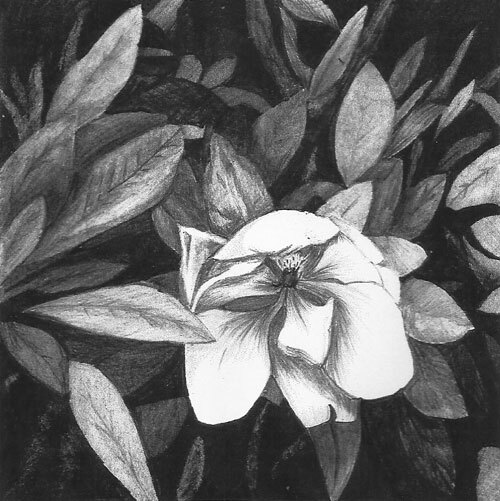 And I like the way the flower is not on the top-most layer, so the surrounding space both projects and recedes. I can see too that you've established vague shapes deep in the background that also serve to increase the sense of depth. That said, you've pushed all those elements very far back, which leaves a gap in the steps of recession. I'll return to that later. Almost certainly I could have pushed some of those elements even deeper into the shade. But not all. 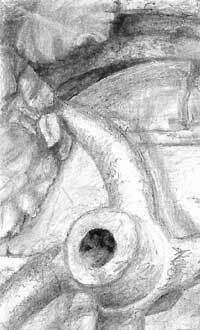 Some, or parts of some, must remain as mid-values so the eye can dig deeper step by step. Leave some just understandable, and make the viewer work harder to see others. You will draw them in, ever deeper, and suggest many more layers of depth. There's another way of suggesting depth too that you have elected to omit - cast shadows. Cast shadows do two things - they immediately indicate depth, and they sharply define edges. And those sharp edges clearly separate the two planes, which reinforces the depth. Without the shadows, leaf A and leaf B could be touching each other. The cast shadow of A states that they are not; creating depth. The same applies to leaf C and the flower. 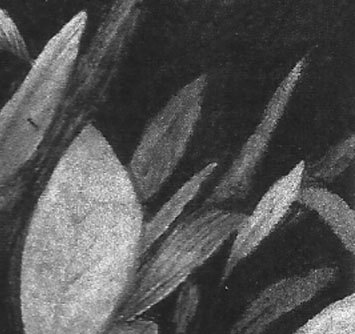 Again, the leaf is now clearly spaced away from the flower, and its cast shadow also lifts it up and above the leaf below. As well as creating a sense of depth, cast shadows also tell us a lot about the form of the surface they are falling on - and that is often of equal, or even more, importance than the separation they create. As I said, I really like this, Tom. It just needs a little refining to make it even more special. I enjoyed the process of putting into practice the various elements that we covered our the past 8 weeks. In fact I found it easier as I went along. I know that I have the need to put in plenty of practice for it to come more naturally particularly negative space. I tried to approach the feathers in this way similar to short hair. 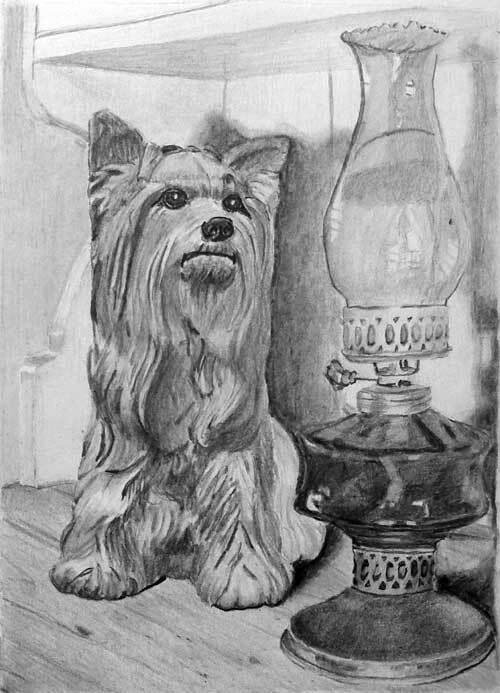 I am mostly pleased with the result as this is the first of this type a drawing I have completed so I am looking forward to your comments. You've every right to be pleased - especially as it's your first composite drawing with the minimum of reference photos. Robbie the dog is looking good - plenty of texture but perhaps a little lacking in three-dimensional form, and in trying to depict detail I think you've lost some of the impression of him being a black dog. His coat appears to be woolly rather than black and shiny. However, it does no harm and adds to his character, as does the bright glint in his eye. 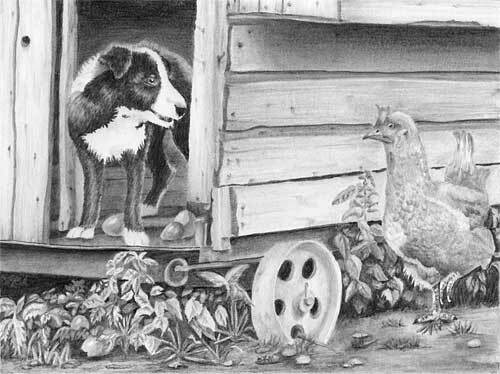 A darker interior in the henhouse would have forced you to use more intense blacks within Robbie and added more depth to the drawing, but the two balance well as they are. 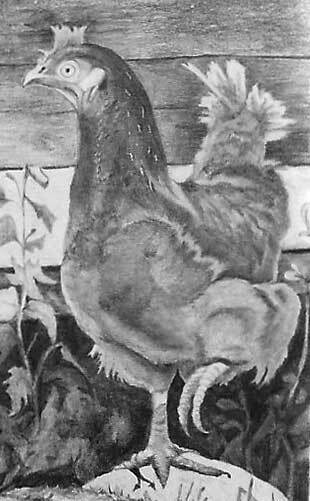 I must mention his back foot - it's inside the dark henhouse and probably in the shade of his body too, but you've drawn it as brightly lit as his front feet. Remind yourself constantly that you're creating a three-dimensional world, and not the two-dimensional representation on your paper. You've nicely displayed the broken eggs, and they look smooth and semi-reflective too. The wood of the henhouse has a pleasing and rustic appearance. Although your nails are very dominant, the wood itself doesn't attract unwanted attention, as a secondary element shouldn't. And you've used the wood well to make the hen to stand out from of it. Henrietta is looking good. Your short-hair technique has produced a believable covering of feathers without them being over-detailed, and she has good three-dimensional form, due to your bold use of contrasting tones. She is missing her dark eye with the bright highlight, which is a pity, because you can use that to draw immediate attention to her. Also, her raised foot is rather vague. Personally, I would have highlighted that foot. Although we can't tell if she's running or has paused, that foot adds the only movement and tension to the simple story, so it benefits from being clearly visible. The foliage is good if a little lacking in detail and depth. Almost all of your leaves are tonally similar, yet some leaves are beneath, or in the shade of, the henhouse. Other leaves are in the shade of those above, and only the foreground leaves will receive direct sunlight. 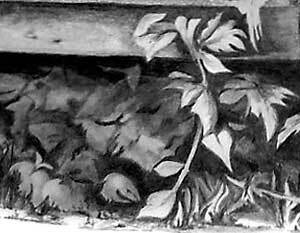 You just needed to darken and push some leaves further back to add depth and make the foreground leaves spring forwards. The rusty wheel is well studied if slightly bent. Ellipses need to be perfectly formed or they instantly look wrong, because we instinctively know what a correct ellipse looks like. The foreground is admirable! 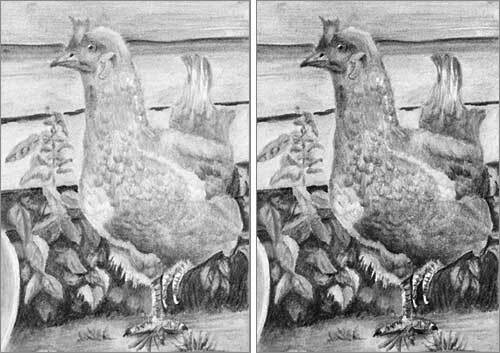 The broken ground and clumps of grass are nicely judged, both to ground the hen, and lead in the eye without attracting the viewer's eye away from the two main players. Given that this is outside of your usual subject matter, I'm very pleased with this result. The other thing that has come from this course was the need to meet a deadline each week and that of course kept me drawing each week. As a result I feel my confidence has improved as a result. In the past if I haven't lifted a pencil for awhile the its a bit like starting again. I know exactly what you mean. I once ran out of confidence in the middle of a drawing. I worked at the office end of my studio from April until October, when I finally told myself to just make a mark. That mark lead to the next and, before I knew it I was drawing again! I think the eight weeks of the course is just a comfortable span with the weekly goal of completing the exercises. Now you're back into drawing I hope it stays that way for you, because nothing generates confidence the way actual results do. Thanks for joining me at Drawspace.